A sheer fabric with a light-as-air look, organza is used in delicate garments and home decor. Traditionally, silk organza was made from continuous silk filaments, which is costly. 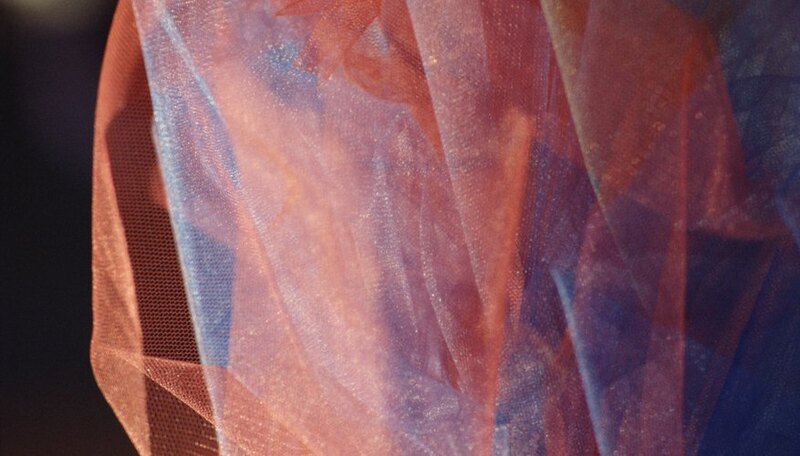 Alternatives to the pricier silk organza are now made from filaments of nylon, polyester and occasionally silk. It is smooth to the touch and has a feminine quality that lends itself to romantic fashions and home accessories. Curl organza fabric to give your garment or accessory that extra oomph with a petal-style or scalloped edge. Cut organza to whatever project specifications you might have. Light a candle, and watch the wick until it stops sparking. Grasp the organza about 3 inches from the edge that you want to curl. Place the edge you want curled about 2 inches above the candle flame. Hold the organza as the edge curls. Remove from the heat of the flame when you have the desired results. Blow out the candle when you are finished. Remove any glue from the glue gun while it is unplugged. Plug the glue gun into the outlet to warm. Place organza on a metal surface, such as foil or a baking sheet. Run the hot tip of the glue gun along the organza edge that you want curled. Turn off and unplug the glue gun when you are finished. Organza can catch fire and should not be placed directly into a flame. Glue guns can cause serious burns and should always be unplugged when not in use. Stephanie Rieper is a professional writer and editor based in Texas. Since 2000, she has been contributing to publications such as "Services" magazine for the U.S. Department of Defense, textbooks for Houghton Mifflin Harcourt and lessons for Sylvan Learning Center. Rieper holds a Bachelor of Science in education from Texas State University.